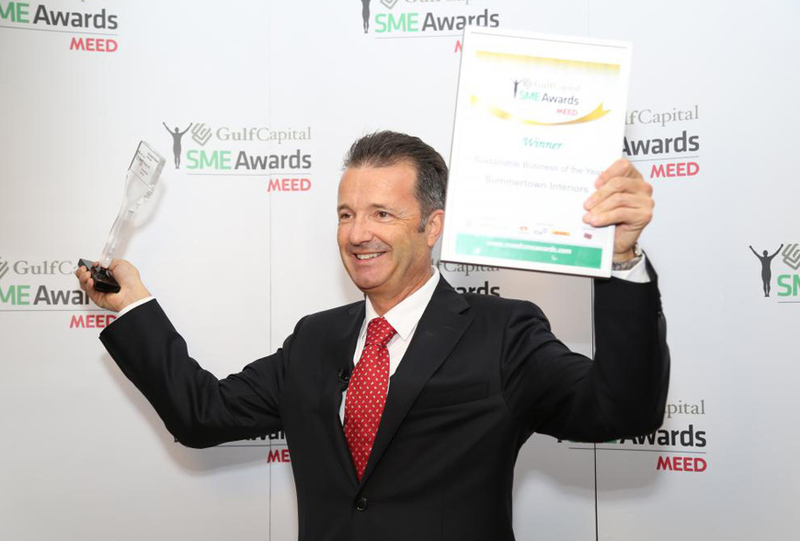 Summertown Interiors is proud to announce that the company has been awarded Sustainable Business of the Year at the Gulf Capital SMEinfo Awards 2014 in Dubai. Summertown was selected by an independent panel of regional business leaders, SME enablers from the government, and highly respected members of the UAE business community. The judges praised Summertown for the various sustainability measures that the company has initiated, particularly its green initiatives on site, office recycling program, green auditing, CSR purchasing guidelines and health and wellness program. In addition Summertown have been applauded for leading the way in the industry with its LEED Gold certification offices. Marcos Bish, Managing Director for Summertown received the award. “I am incredibly proud to receive this accolade. Sustainability is embedded in us as a company. We live and breathe these values involving everyone across the organization. This truly is a team effort and demonstrates how success can be achieved by working collectively to achieve our CSR goals”.